Hudson County is the smallest county in New Jersey and one of the most densely populated in United States. It takes its name from the Hudson River, which creates part of its eastern border. Part of the New York metropolitan area, its county seat and largest city is Jersey City. According to the U.S. Census Bureau, the county has a total area of 62 square miles (160.6 km2), of which 47 square miles (121.7 km2) is land and 16 square miles (41.4 km2) (25.21%) is water. It is the smallest of New Jersey's 21 counties. Hudson is located in the heart of New York metropolitan area Tri-State Region in northeastern New Jersey. It is bordered by the Hudson River and Upper New York Bay to the east; Kill van Kull to the south; Newark Bay and the Hackensack River or the Passaic River to the west; its only land border is shared Bergen County to the north and west. The highest point, at 260 feet (79 m) above sea level is in West New York;. the lowest point is sea level. Ellis Island and Liberty Island, opposite Liberty State Park, lie entirely within Hudson County's waters, which extend to the New York state line. Liberty Island is wholly part of New York. Ellis Island is jointly administered by the states of New Jersey and New York. Nine-tenths of its land is technically part of Hudson County, with the remainder being part of New York. Shooters Island, in the Kill van Kull, is also shared with New York. Robbins Reef Light sits atop a reef which runs parallel the Bayonne and Jersey City waterfront. Henry Hudson, for whom the county and river on which it sits is named, established a claim for the area in 1609 when anchoring his ship the Halve Maen (Half Moon) at Harsimus Cove and Weehawken Cove. The west bank of the North River (as it was called) and the cliffs, hills, and marshlands abutting and beyond it, were settled by Europeans (Dutch, Flemish, Walloon, Huguenot) from the Lowlands around the same time as New Amsterdam. In 1630, Michael Pauw received a land patent, or patroonship and purchased the land between the Hudson and Hackensack Rivers, giving it the Latin-ized form of his name, Pavonia. He failed to settle the area and was forced to return his holdings to the Dutch West India Company. Homesteads were established at Communipaw (1633), Harsimus (1634), Paulus Hook (1638) and Hoebuck (1643). Relations were tenuous with the Lenape, and eventually led to Kieft's War, which began as a slaughter by the Dutch at Communipaw and is considered to be one of the first genocides of Native Americans by Europeans. A series of raids and reprisals across the province lasted two years, and ended in an uneasy truce. Other homesteads were established at Constable Hook (1646), Awiehaken (1647), and other lands at Achter Col on Bergen Neck. 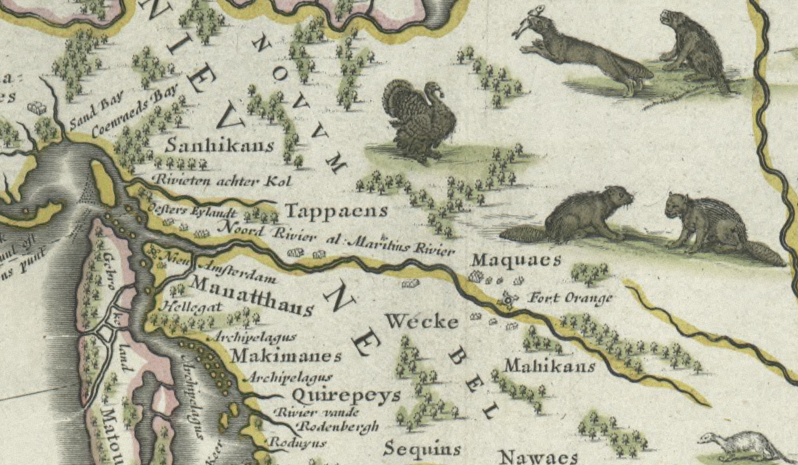 In 1658, Director-General Peter Stuyvesant of New Netherland negotiated a deal with the Lenape to re-purchase the area named Bergen, "by the great rock above Wiehacken," including the whole peninsula from Sikakes south to Bergen Point/Constable Hook. In 1661, a charter was granted the new village/garrison at the site of present-day Bergen Square, establishing what is considered to be the oldest self-governing municipality in New Jersey. The British gained control of the area in 1664, and the Dutch finally ceded formal control of province to the English in 1674. By 1675, the Treaty of Westminster finalized the transfer and the area became part of the British colony of East Jersey, in the administrative district of Bergen Township. The county's seat was transferred to Hackensack in 1709, after Bergen County was expanded west. Small villages and farms supplied the burgeoning city of New York, across the river, notably with oysters from the vast beds in the Upper New York Bay, and fresh produce, sold at Weehawken Street, in Manhattan. During the American Revolutionary War the area was under British control which included garrsions at Bulls Ferry and the fort at Bergen Neck. Colonialist troops used the heights to observe enemy movements. The Battle of Paulus Hook, a surprise raid on a British fortification in 1779, was seen as an a victory and morale booster for revolutionary forces. Many downtown Jersey City streets bear the name of military figures Mercer, Greene, Wayne, and Varick among them. 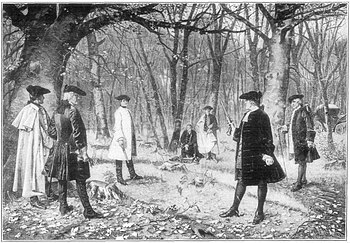 Weehawken became notorious for duels, including the nation's most famous between Alexander Hamilton and Aaron Burr in 1804. Border conflicts for control of the waterfront with New York (which claimed jurisdiction to the high water line  and the granting of ferry concessions) restricted development though some urbanization took place in at Paulus Hook and Hoboken, which became a vacation spot for well-off New Yorkers. The Morris Canal, early steam railroads, and the development of the harbor stimulated further growth. In September 1840, Hudson County was created by separation from Bergen County and annexation of some Essex County lands, namely New Barbadoes Neck. During the 19th century, Hudson played an integral role in the Underground Railroad, with four routes converging in Jersey City. Most of Hudson County, apart from West Hudson, was part of Bergen Township, created by an Act of the New Jersey Legislature on February 21, 1798, as one of the first group of 104 townships formed in New Jersey, while the area was still a part of Bergen County. As originally constituted, Bergen Township included the area between the Hudson River on the east, the Hackensack River to the west, south to Constable Hook/Bergen Point and north to the present-day Hudson-Bergen border. For the next 127 years civic borders within the county took many forms, until they were finalized with the creation of Union City in 1925. The City of Jersey was incorporated by an Act of the New Jersey Legislature on January 28, 1820, from portions of Bergen Township. The city was reincorporated on January 23, 1829, and again on February 22, 1838, at which time it became completely independent of Bergen Township and was given its present name. On February 22, 1840, it became part of the newly-created Hudson County. As Jersey City grew, several neighboring communities were annexed: Van Vorst Township (March 18, 1851), Bergen City and Hudson City (both on May 2, 1870), and Greenville Township (February 4, 1873). While a majority of the voters approved the merger, only Jersey City, Hudson and Bergen could be consolidated since they were the only continuous approving towns. Both the Town of Union and Union Township could not be included due to the dissenting vote of West Hoboken which lay between them and Hudson City. On March 17, 1870, Jersey City, Hudson City and Bergen merged into Jersey City. Only three years later the present outline of Jersey City was completed when Greenville agreed to merge into the Greater Jersey City. Neighborhoods grew as farms, estates, and other holdings were sub-divided for housing, civic and religious architecture. Streets (some with trolley lines) were laid out. Stevens Institute of Technology and Saint Peter's College were established. Central Railroad of New Jersey's Communipaw Terminal, across a small strait from Ellis Island and The Statue of Liberty, played a crucial role in the massive immigration of the period, with many newly-arrived departing the station to embark on their lives in America. Many, though, decided to stay, taking jobs on the docks, the railroads, the factories, the refineries, and in the sweatshops and skyscrapers of Manhattan. Many manufacturers, whose names read as a "who's who" in American industry established a presence, including Colgate, Dixon Ticonderoga, Maxwell House, Standard Oil, and Bethlehem Steel. Upon entry to World War I the US government took the Hamburg-American Line piers in Hoboken under eminent domain, and Hudson became the major point of embarkation for more than three million soldiers, known as "doughboys". In 1916, an act of sabotage literally and figuratively shook the region when German agents set off bombs at the munitions depot in New York Bay at Black Tom. The fore-runner of Port Authority of New York and New Jersey was established on April 30, 1921. Huge transportation projects opened between the wars: The Holland Tunnel in 1927, The Bayonne Bridge in 1931, and The Lincoln Tunnel in 1937, allowing vehicular travel between New Jersey and New York City to bypass the waterfront. Hackensack River crossings, notably the Pulaski Skyway, were also built. What was to become New Jersey City University opened. Major Works Progress Administration projects included construction of stadiums in Jersey City and Union City. Both were named for President Franklin D. Roosevelt, who attended the opening of the largest project of them all, The Jersey City Medical Center, a massive complex built in the Art Deco Style. During this era the "Hudson County Democratic Machine", known for its cronyism and corruption, with Jersey City mayor Frank Hague at its head was at its most powerful. Industries in Hudson were crucial to the war effort during WWII, including the manufacture PT boats by Elco in Bayonne. Military Ocean Terminal at Bayonne (MOTBY) was opened in 1942 as a U.S. military base and remained in operation until 1999. Exchange Place as seen from Liberty State Park. At 781 feet (238 m), the Goldman Sachs Tower is New Jersey's tallest building. The county since the mid-1990s has seen much real estate speculation and development and a population increase, as many new residents purchase existing housing stock as well as condominiums in high and mid rise developments, many along the waterfront. What had started as a gentrification in the 1980s became a full-blown "redevelopment" of the area as many suburbanites, transplanted Americans, internationals, and immigrants (most focused on opportunities in NY/NJ region and proximity to Manhattan) began to make the "Jersey" side of the Hudson their home, and the "real-estate boom" of the era encouraged many to seek investment opportunities. The exploitation of certain parts of the waterfront and other brownfields led to commercial development as well, especially along former rail yards. Hudson felt the short and long term impact of the destruction of the World Trade Center intensely: its proximity to lower Manhattan made it a place to evacuate to, many residents who worked there lost their jobs (or their lives), and many companies sought office space across the river. Re-zoning, the Hudson-Bergen Light Rail, and New Jersey State land-use policy of transit villages have further spurred construction. Though very urban and with some of the highest residential densities in the United States the Hudson communities have remain fragmented, due in part to New Jersey's long history of home rule in local government; geographical factors such as Hudson River inlets/canals, the cliffs of the New Jersey Palisades and rail lines; and ethnic/demographic differences in the population. As the county sees more development this traditional perception is challenged. As of the United States 2000 Census, the population was 608,975. It is part of the New York Metropolitan Area. There were 230,546 households and 143,630 families residing in the county. The population density was 13,044 people per square mile (5,036/km²). It is the sixth-most densely populated county in the United States, trailing only four of New York City's boroughs (all except Staten Island) and San Francisco County, California. There were 240,618 housing units at an average density of 5,154 per square mile (1,990/km²). The racial makeup of the county was 55.58% White, 13.48% Black or African American, 0.42% Native American, 9.35% Asian, 0.06% Pacific Islander, 15.48% from other races, and 5.63% from two or more races. 39.76% of the population were Hispanic or Latino of any race. According to Census 2000 9.9% were of Italian and 6.7% Irish ancestry. By 2009, 34.5% of the population were non-Hispanic whites. Approximately 14.6% of the population was black. About 11.9% of the population was Asian. About 1.9% of the population were of two or more races. Hispanics and Latinos made up 40.7% of the population. As of the 2010 Census, Hudson County’s population is 634,266 (up 21,575 from the 2000 Census), 42% of which is Hispanic. As of 2010, the county has 270,335 housing units, 9% of which were vacant as of the 2010 Census. The median income for a household in the county was $40,293, and the median income for a family was $44,053. Males had a median income of $36,174 versus $31,037 for females. The per capita income for the county was $21,154. About 13.30% of families and 15.50% of the population were below the poverty line, including 22.00% of those under age 18 and 15.70% of those age 65 or over. Advocates for the homeless counted 2,227 people without homes in Hudson County as of January 2008. In 2009, the Hudson County Alliance to End Homelessness counted 1,779 homeless people. The same number was counted in 2010. Three homeless shelters are located in the county: Lucy's Shelter in Jersey City, Palisades Emergency Residence Corp. in Union City and the Hoboken Homeless Shelter in Hoboken. Hudson County is the most densely populated county in the state. The only city in Hudson that is among the one hundred most populous cities in the United States is Jersey City which was ranked 78th in the United States Census Bureau's rankings based on the 2009 population estimate. The County Executive is elected by a direct vote of the electorate. The executive, together with the Board of Chosen Freeholders in a legislative role, administer all county business. Nine members are elected concurrently to serve three-year terms as Freeholder, each representing a specified district which are equally proportioned based on population. Each year, in January, the Freeholders select one of their nine to serve as Chair and one as Vice Chair for a period of one year. Hudson County's County Executive is Thomas A. DeGise. Hudson County's Clerk is Barbara A. Netchert. Three federal Congressional Districts cover the county, including portions of New Jersey's 9th congressional district, represented by Steve Rothman (D), New Jersey's 10th congressional district, represented by Donald Payne (D) and New Jersey's 13th congressional district, represented by Albio Sires (D). The county seat of Hudson County is located near The Five Corners on Newark Avenue in Jersey City, northeast of Journal Square. The Hudson County Courthouse, and the adjacent Hudson County Administration Building, at 595 Newark Avenue, are home to various courts, agencies and departments. The Hudson County court system consists of several municipal courts, including the busy Jersey City Court, plus the Hudson County Superior Court. Many county offices and Hudson County Sheriff's patrol headquarters are located at Hudson County Plaza at 257 Cornelison Avenue in Jersey City. The Hudson County Correctional Facility is located in South Kearny. The Hudson County Meadowview Psychiatric Hospital is on County Avenue, Secaucus. Hudson County is very favorable for the Democratic Party. In the 2004 U.S. Presidential election, John Kerry carried the county by a 35.3% margin over George W. Bush, with Kerry carrying the state by 6.7% over Bush. In 2008, Barack Obama won Hudson County by a 46.3% margin over John McCain. Democrat Jon Corzine beat Republican Doug Forrester by a 3-to-1 margin in the 2005 gubernatorial race. Both Republican candidates failed to carry even one municipality within the county. Two out of the three statewide elected officials, Governor Corzine and United States Senator Bob Menendez, hail from Hudson County. In the 2009 New Jersey gubernatorial election, Corzine received 76,145 votes from Hudson County to Republican Chris Christie's 29,301, but Christie won the state overall, beating Corzine by 3 percentage points statewide. CRRNJ Terminal in Liberty State Park, Ellis Island and Statue of Liberty ferry slips in foreground. Cape Liberty Cruise Port in Bayonne is one of three passenger terminals in Port of New York and New Jersey. The German-American Volksfest has taken place annually since 1874 at Schuetzen Park  This private park and the many nearby cemeteries-Flower Hill Cemetery, Grove Church Cemetery, Hoboken Cemetery, Macphelah Cemetery and Weehawken Cemetery that characterize the western slope create the "green lung" of North Hudson County. Pershing Field and the adjacent reservoir constitute one of the largest "green spaces" in the county. The reservoir, no longer in use, is site of a planned recreation area/nature preserve. Hackensack Number Two, the other remaining reservoir in Weehawken Heights, is not accessible to the public. Extensive athletic fields opened in 2009 in Weehawken and Union City, the latter on the site of the former Roosevelt Stadium. Liberty State Park, the county's largest, is sited on land that had once been part of a vast oyster bed, was landfilled for industrial, rail, and maritime uses, and was reclaimed in the 1970s. Ellis Island and Liberty Island, a national protected area and home to the Statue of Liberty National Monument, lie entirely within Hudson's waters across from Liberty State Park, from which ferry service is available. The New Jersey Meadowlands Commission has designated several areas within its juridisction as wetlands preservation zones including the Riverbend Wetlands Preserve, Eastern Bracish Marsh, and Kearny Marsh an extension of De Korte Park, home of the Meadowlands Environment Center. Various businesses and industries are headquartered or had their start in Hudson County. Secaucus is home to My Network TV's flagship station WWOR-TV, Red Bull New York, MLB Network, NBA Entertainment, Goya Foods, The Children's Place and Hartz Mountain. Jersey City is home to Verisk Analytics and WFMU 91.1FM (WMFU 90.1FM in the Hudson Valley), the longest running freeform radio station in the United States. Hoboken is the birthplace of the first Blimpie restaurant, and home to one of the headquarters of publisher John Wiley & Sons. In the 20th century, Union City was the "embroidery capital of the United States", the trademark of that industry appearing on that city's seal. North Bergen is home to The Vitamin Shoppe's headquarters. Weehawken is home to the headquarters of New York Waterway, as well as offices for Swatch Group USA, UBS and Hartz Mountain. ^ Hudson County New Jersey Street Map. Hagstrom Map Company, Inc. 2008. ISBN 0-8809-7763-9. ^ "Hudson County High Point, New Jersey". Peakbagger.com. http://www.peakbagger.com/peak.aspx?pid=7139. ^ Holusha, John. " Commercial Property / The Jersey Riverfront; On the Hudson's West Bank, Optimistic Developers", The New York Times, October 11, 1998. Accessed May 25, 2007. "That simply is out of the question in midtown, he said, adding that some formerly fringe areas in Midtown South that had previously been available were filled up as well. Given that the buildings on the New Jersey waterfront are new and equipped with the latest technology and just a few stops on the PATH trains from Manhattan, they become an attractive alternative. It's the sixth borough, he said." ^ Garbarine, Rachelle (April 19, 1998). "Commercial Property/North Bergen, N.J.; Work Begins on a 350,000-Sq.-Ft. Retail Center". New York Times. http://www.nytimes.com/1998/04/19/realestate/commercial-property-north-bergen-nj-work-begins-on-a-350000-sq-ft-retail-center.html?scp=30&sq=north%20bergen&st=cse. Retrieved 2011-02-20. ^ Hoboken's earliest days: Before becoming a city, 'Hobuck' went through several incarnations, Hudson Reporter, January 16, 2005. "On October 2, 1609, Henry Hudson anchored his ship, the Half Moon, in what is now Weehawken Cove. Robert Juet, Hudson's first mate, wrote in the ship's log, "[W]e saw a good piece of ground ... that looked of the color of white green." The rock of which Juet wrote makes up Castle Point in Hoboken; nowhere else along the Hudson River exists a white-green rock formation." ^ "Jersey City's Underground Railroad history," Jersey City Magazine, Spring & Summer 2005. ^ a b c d e "The Story of New Jersey's Civil Boundaries: 1606–1968", John P. Snyder, Bureau of Geology and Topography; Trenton, New Jersey; 1969. p. 146-147. ^ "The Story of New Jersey's Civil Boundaries: 1606–1968", John P. Snyder, Bureau of Geology and Topography; Trenton, New Jersey; 1969. p. 145. ^ "How Hoboken became a city," Part I, Part II, Part III, Hoboken Reporter, March 27, April 3, and April 10, 2005. ^ "The Story of New Jersey's Civil Boundaries: 1606–1968", John P. Snyder, Bureau of Geology and Topography; Trenton, New Jersey; 1969. p. 149. ^ "The Story of New Jersey's Civil Boundaries: 1606–1968", John P. Snyder, Bureau of Geology and Topography; Trenton, New Jersey; 1969. p. 147. ^ "The Story of New Jersey's Civil Boundaries: 1606–1968", John P. Snyder, Bureau of Geology and Topography; Trenton, New Jersey; 1969. p. 146. ^ "Consolidation in New Jersey". New York Times. August 14, 1869. http://query.nytimes.com/mem/archive-free/pdf?res=F70B16FD3E5F137B93C6A81783D85F4D8684F9. Retrieved 2011-01-27. ^ "The Story of New Jersey's Civil Boundaries: 1606–1968", John P. Snyder, Bureau of Geology and Topography; Trenton, New Jersey; 1969. p. 148. ^ "INDUSTRY GROWING IN HUDSON COUNTY; More Than $25,000,000 Being Spent in Public and Corporate Improvements.INQUIRIES FOR GOOD SITESNew Steamship Terminal Plannedfor North Bergen--Increase in Building. Improving Waterways. Expending $125,000,000". The New York Times. April 21, 1929. http://select.nytimes.com/gst/abstract.html?res=F50615FE3D5E1B7A93C3AB178FD85F4D8285F9&scp=47&sq=hudson%20county&st=cse. ^ Kelley, Tina. "Trump Unveils Condo Plan in Jersey City", The New York Times, September 23, 2005. Accessed March 12, 2008. "At 560 feet, the tallest of the towers would still rank below the state's tallest building, the 781-foot Goldman Sachs tower nearby at 30 Hudson Street." ^ "United States -- County by State, and for Puerto Rico GCT-PH1. Population, Housing Units, Area, and Density: 2000". American Fact Finder. United States Census Bureau. http://factfinder.census.gov/servlet/GCTTable?_bm=y&-ds_name=DEC_2000_SF1_U&-CONTEXT=gct&-mt_name=DEC_2000_SF1_U_GCTPH1_US9&-redoLog=false&-_caller=geoselect&-geo_id=&-format=US-25. Retrieved 2011-05-18. ^ "Table 1: Annual Estimates of the Population for Incorporated Places Over 100,000, Ranked by July 1, 2009 Population: April 1, 2000 to July 1, 2009" (CSV). 2009 Population Estimates. United States Census Bureau, Population Division. 2010-06-22. http://www.census.gov/popest/cities/tables/SUB-EST2009-01.csv. Retrieved 2010-10-20. ^ Freeholder District 4, Hudson County, New Jersey. Accessed January 5, 2011. ^ Freeholder District 5, Hudson County, New Jersey. Accessed January 5, 2011. ^ Freeholder District 6, Hudson County, New Jersey. Accessed January 5, 2011. ^ Freeholder District 7, Hudson County, New Jersey. Accessed January 5, 2011. ^ Freeholder District 8, Hudson County, New Jersey. Accessed January 5, 2011. ^ Freeholder District 9, Hudson County, New Jersey. Accessed January 5, 2011. ^ Hudson County NJ US President, ourcampaigns.com. Accessed July 30, 2007. ^ Hudson County NJ Governor, ourcampaigns.com. Accessed July 30, 2007. ^ Hudson County, New Jersey Official General Election November 2, 2004, Hudson County Clerk. Accessed July 30, 2007. ^ Hudson County General Election Official Results November 8, 2005, Hudson County Clerk. Accessed July 30, 2007. ^ "Hornblower Cruises". Statuecruises.com. http://statuecruises.com/ferry-service/welcome.aspx. Retrieved June 10, 2010. ^ About Us, WWOR-TV. Accessed November 6, 2007. ^ http://www.merchantcircle.com/business/Red.Bull.New.York.Inc.201-583-1129 Red Bull New York Inc], Merchant Circle, accessed February 20, 2011. ^ NBA Entertainment, Goliath, accessed February 20, 2011. ^ Contact Us, Goya Foods. Accessed November 6, 2007. ^ Vernon, Joan. "Secaucus, N.J.-Based Children's Place Seeks to Convert Browsers into Buyers. ", The Record, February 27, 2004. Accessed July 16, 2008. ^ WFMU. "About WFMU FAQ". Wfmu.org. http://wfmu.org/about.shtml. Retrieved June 10, 2010. ^ Kleinfield, N.R. (1987-12.13). "Trying to Build a Bigger Blimpie". The New York Times. http://query.nytimes.com/gst/fullpage.html?res=9B0DE5D91F3FF930A25751C1A961948260. Retrieved 2008-08-07. ^ Wright, Robert E.; Timothy C. Jacobson, George David Smith (2007). Knowledge for Generations: Wiley and the Global Publishing Industry, 1807–2007. Hoboken, NJ: John Wiley & Sons. ISBN 0-471-75721-7. ^ Cunningham, John (2004). This is New Jersey 4th ed.. Yonkers, NY: Rutgers University Press. p. 100. ISBN 0-8135-2141-6. ^ "NY Waterway". NY Waterway. http://www.nywaterway.com/. Retrieved 2011-03-20. ^ "Subsidiaries in the Americas". Swatch Group. 2011. http://www.swatchgroup.com/en/brands_and_companies/distribution/worldwide_distribution/americas. Retrieved 2011-03-18. ^ "Directions to our US headquarters". UBS. http://financialservicesinc.ubs.com/wealth/DirectionstoOurUSHeadquarters.html. Retrieved 2011-03-18. ^ "Major Employer's List". Hudson County Economic Developmen Corporation. http://www.hudsonedc.org/hudson-employers.pdf. Retrieved 2011-03-20. ^ "The Tipsheet: ‘Mercy’ Brings Jersey City to the Small Screen, AhoraJC, Biking the Studio Tour and More". The Jersey City Independent. September 30, 2009. http://www.jerseycityindependent.com/2009/09/30/the-tipsheet-mercy-brings-jersey-city-to-the-small-screen-ahorajc-set-for-liftoff-biking-the-studio-tour-and-the-new-loews-season/. Retrieved September 30, 2009. ^ "Bayonne museum eyes opening". NJ.com. October 22, 2009. http://www.nj.com/news/jjournal/bayonne/index.ssf?/base/news-5/1256192756294190.xml&coll=3. Retrieved 2010-10-20. "City officials plan to open the new Bayonne Community Museum in the former Fleet Bank building at 231 Broadway by early spring next year, said Henry Sanchez, president of the Board of Trustees for Bayonne Community Museum." ^ "2008 Hoboken Artists Studio Tour kicks off at noon". NJ.com. October 19, 2008. http://www.nj.com/hudson/index.ssf/2008/10/2008_hoboken_artists_studio_to.html. Retrieved 2010-10-20. ^ "Statue of Liberty National Monument". National Park Service. http://www.nps.gov/stli/. Retrieved 2010-01-21. This page uses content from the English language Wikipedia. The original content was at Hudson County, New Jersey. The list of authors can be seen in the page history. As with this Familypedia wiki, the content of Wikipedia is available under the Creative Commons License.